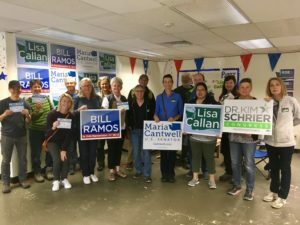 Indivisible Eastside » Events » Canvass for Kim Schrier with Indivisible Eastside! Canvass for Kim Schrier with Indivisible Eastside! Join Indivisible Eastside members to knock doors for 8th CD Candidate Kim Schrier. This type of interaction has proven to boost voter turnout better than any other type of contact. If you’ve never done this before, we’ll pair you with an experienced members who will take the lead until you feel comfortable giving it a try. Our first group outing had positive reviews by all first time canvassers.